Independence Day: Resurgence saw the return of the locust-like Alien race who's initial attack on Earth in 1996 failed. This time, accompanied by their Queen, the hostile Extraterrestrials brought an onslaught of reinforcements to seek both revenge on Humanity and to capture an unknown, sentient life form, who traveled to Earth to forewarn Humanity of the impending attack. 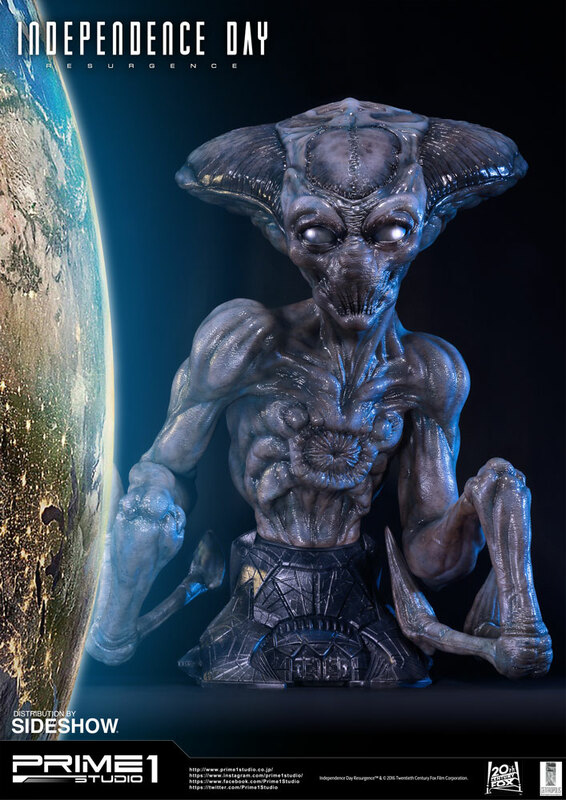 Independence Day: Resurgence's Aliens are one of the most iconic and recognizable creations in recent history and now, fans can own a life-size bust of one for themselves! Sideshow Collectibles and 20th Century Fox teamed up once again to produce both a life-size bust (below) as well as an upcoming Alien Soldier statue (bottom) to commemorate the resurgence of the Independence Day film franchise. The life-size bust stands 32-inches tall and comes with a $699.99 price tag. The Alien Soldier statue dimensions, release date and price have yet to be revealed, but a teaser preview for the piece has been released, which you can see below. Sideshow and Prime 1 Studio are proud to present the Alien Life-Size Bust from Independence Day: Resurgence. 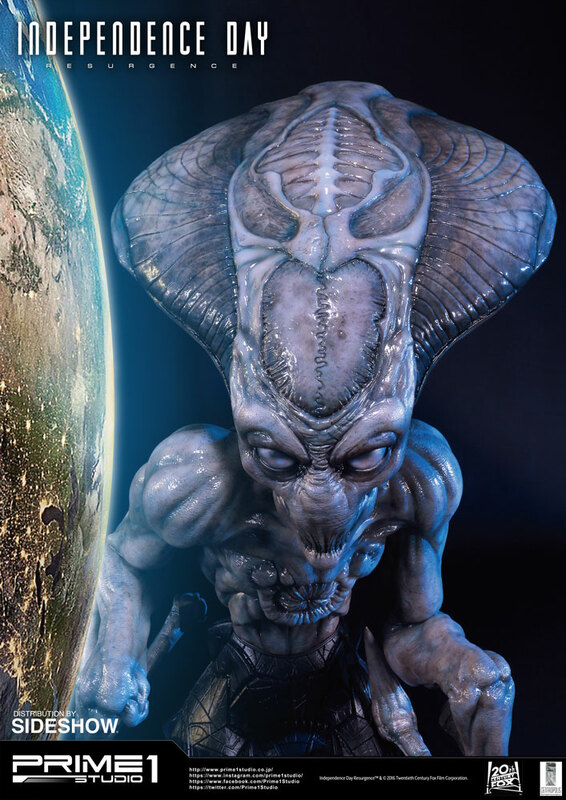 The Aliens are a nameless race of highly intelligent and technologically advanced extraterrestrial beings. They are a hive mind race with the intention of conquering and harvesting planets at the expense of driving the native population to extinction. The aliens, interestingly, have no name. Even 20 years after the War of 1996, the closest the humans ever come actually naming the aliens is calling the creatures “Them”. As more details arrive for these two products, as well as any new ones, we'll be sure to keep you updated! 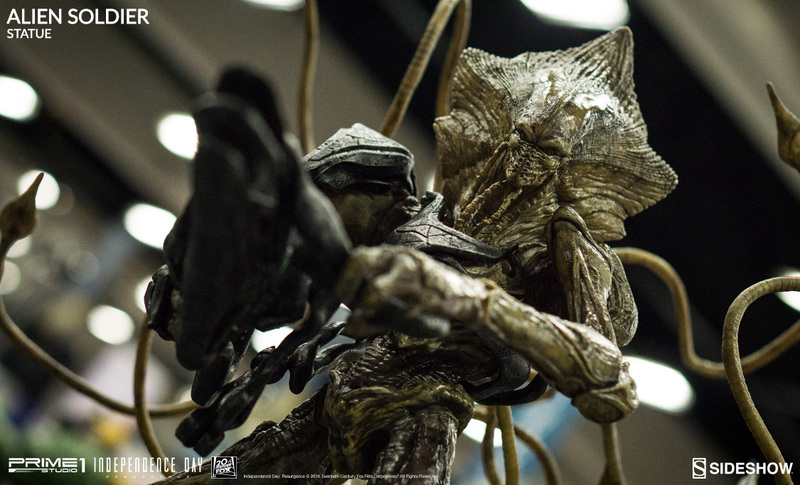 1 Fan responses to Sideshow Collectibles unveil life-size Independence Day Alien statue! I LOVE THESE!! !I loved Independence Day:Resurgence though some people say it's not good.